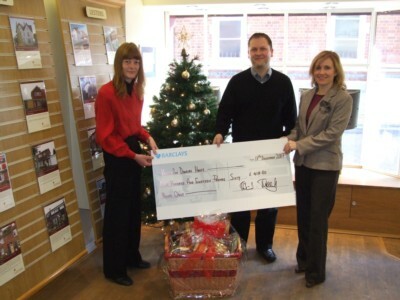 We are really pleased to announce that Lesters have raised over £400 for the local charity Helen & Douglas House. After a couple of days in Wallingford’s town square and their open evening at their office on the Medieval evening Lesters are pleased to hand over the money raised to the locally based charity. Seen in the picture below is partner Julian Walley, local resident Sue Stone of Crowmarsh (winner of the Christmas hamper) and Vanessa from Helen & Douglas house. Julian Walley partner at the local firm would like to thank all the people of Wallingford for putting their donations to what I am sure we all agree is a worthy cause so close to Christmas, guessing the balloons in the Lesters mini and coming in our office on the medieval shopping evening which was as busy as always! We would like to wish all clients, past and present and the local people of Wallingford and the surrounding area a Happy Christmas and a prosperous new year!